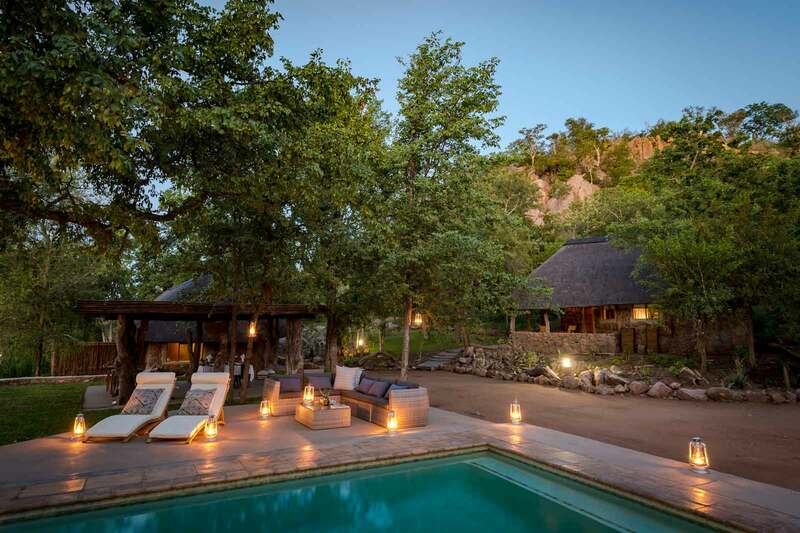 Chacma Bush Camp is located in the Maseke Balule Game Reserve in the Greater Kruger. The area is situated between Hoedspruit and Phalaborwa in Limpopo Province. 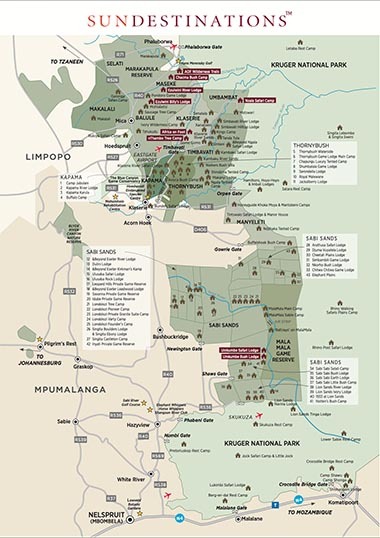 It is an 8000 hectare private game reserve, which shares open borders with the Kruger National Park. The undulating landscape is home to the Olifants River south of the of camp and old mica caves dot the landscape throughout. Prominent mountainous ridges and boulder koppies characterise the terrain, making it an interesting region to explore on drive. Chacma Bush Camp is easily accessible for fly-ins and self-drivers. There are a few ways of getting to Chacma. Guests that choose to self-drive will be met at the gate and escorted to park their cars at camp. Fly into Hoedspruit Airport (Eastgate Airport) and either self-drive or road transfer to camp. The distance is roughly 50 km from the centre of Hoedspruit. Chacma is located at the entrance of the Lamai Gate, Maseke Game Reserve which is off the R40. There will be a brown signboard ‘Balule Grietjie' - turn right at the sign and bear right again where you will see the Lamai Gate in front of you. It’s 4.2 km from the gate to camp. Fly into Phalaborwa Airport (Hendrick van Eck Airport) and either self-drive or road transfer to camp, which is about 25km away. Chacma is located at the entrance of the Lamai Gate, Maseke Game Reserve which is off the R40. There will be a brown signboard ‘Balule Grietjie' - turn left just after this sign and bear right again where you will see the Lamai Gate in front of you. It’s 4.2 km from the gate to camp. Fly into O.R Tambo and self-drive, or arrange a road transfer when making your reservation reservations@sundestinations.co.za. Driving time is roughly 6 - 7 hours. 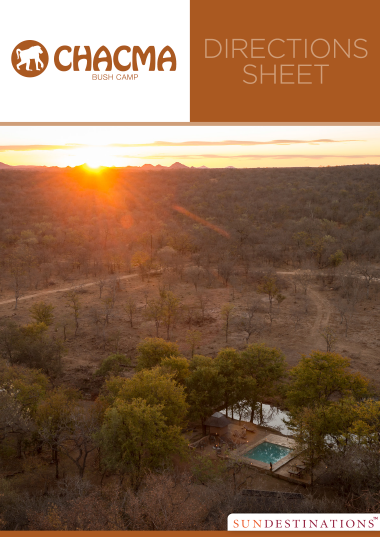 There is a conservation levy of R250 per person, payable at the camp.